Trace your family history with the help of a professional genealogist. Then publish your family history to preserve it forever. Already researched your genealogy? We can help you organize and publish your research. Chose to tell your entire life story, publish a memoir of part of your life or create an ethical will expressing your values and personal philosophy. Have memory books created for special occasions such as a 50th wedding anniversary or 80th birthday. Costs will vary, depending on the scope of your project, which may range from an interview transcript to a detailed hard-cover book with color photographs. Costs may be shared among family members or paid in installments. We'll work with you to find an option that suits your budget. "It's after midnight and I just finished reading about my family. What an incredible achievement! I'm wildly impressed with how you've organized it and how much information you've managed to pack in. Truly, it's wonderful. StorySeekers is available for presentations on family history and local history as well as beginning genealogy workshops and classes. Member of the Association of Professional Genealogists. To learn more about APG, visit their website at www.apgen.org. 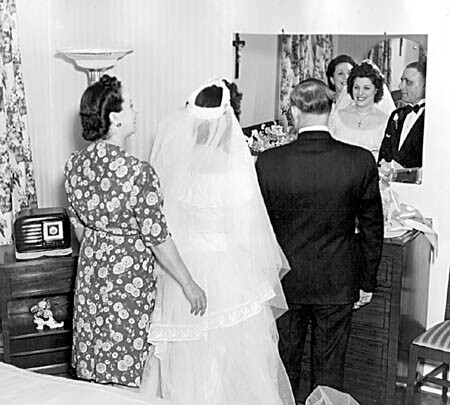 "There are photos of my mother Rose at her wedding to my father in 1946. In one picture she's smiling into a mirror with her parents on either side of her. Nick has an ever so slight grin on his face. I recognize the grin, and the shape of the head, but the hair is dark, not the gray of my Pop Pop memories. Don't call him Pop Pop yet. This is the proud father of the bride, 52 years old when these pictures were taken." Copyright StorySeekers. All rights reserved.